Toby Mincey could have been forgiven if his mind had wandered that April afternoon. He was 18, a few short weeks away from graduating from North Stokes High School and suffering a case of senioritis. because he was wearing a seat belt. College was a few short months away. His folks had gotten him a used car ? a 2000 Saab. New, exciting avenues in his young life were opening, so another boring school-wide assembly wasn't at the top of his list. This particular assembly, a program called Street Smarts, had all the signs of something a kid would tune out. Adults would yammer about safe driving, wearing seat belts, the dangers of texting while driving and the like. To the 18-year-old ear, surely it was going to sound like the principal on a Charlie Brown television special: Wah-wah-wah-wah. "It was mesmerizing," said Ronnie Mendenhall, the principal at North who has seen more than his share of sleepy kids during assemblies. "We have 425 kids here, and you could have heard a pin drop. There was absolute silence." Little did anybody know, least of all Mincey, the white noise of a safe driving program soon would pay huge dividends. On its face, the Street Smarts program looks to be a clever marketing scheme. It's sponsored by a Winston-Salem law firm, Daggett and Shuler, noted for its aggressive advertising. The flaw in that theory is that Street Smarts is an offshoot of a program Dave Daggett has been running for 21 years ? Safe, Sober Prom Night ? in more than 30 area high schools. You don't do something that large for more than two decades as a publicity stunt. Daggett hopes it's kept at least a few kids from drinking and driving on prom night but allows "you can't prove what didn't happen." Anyway, the Street Smarts presentation developed into kind of a "scared straight" program for young drivers. Rescue personnel, firefighters and paramedics worked up a snappy, fast-moving program with plenty of whiz-bang graphics and videos, perfect for Generation Xbox. "It was a very forceful presentation," Mendenhall said. "It was about an hour long, perfect for our school." There was one other thing, too, that really captivated a captive audience at North Stokes. "They had a whole bunch of pictures of trauma patients who'd been in bad wrecks," Mincey said. "That really made me pay attention." Prom night at North Stokes came and went without incident. Parents, teachers, administrators all breathed a collective sigh of relief. A few days later, though, on Monday April 18, the relative calm of spring break for students at a sleepy rural high school was broken. Mincey had gone to spend the night at a friend's house the night before, and they decided to head out to see what the day held in store for them. A few minutes after pulling away from the friend's house, disaster struck on a country road near Sandy Ridge. "I thought I was going about the speed limit. I'm really not sure," Mincey said. "I'd just pulled out, and the music was pretty loud. I was adjusting (the stereo); there was a really high-pitched noise coming out of it. I was totally concentrating on that. "Next thing I know we were going off the road. My passenger warned me ? I looked up and remember seeing a tree that was part of a row of fence posts. The second we hit that tree, I started yelling 'What happened?' 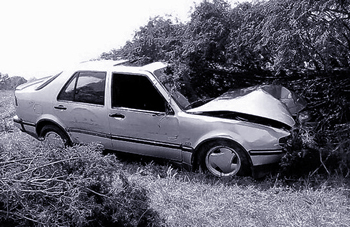 "
What happened was that the Saab was totaled in a matter of seconds. The airbags deployed as they were supposed to, and the seat belt that Mincey had never used before sitting through that dull presentation just a week earlier had left a welt across his neck. "We both said, 'Thank God we had those seat belts on,' " Mincey said. "I've had my license since I was 16 ½, and I didn't normally wear it before that presentation." Mincey and his friend walked to the nearest house they could find ? neither had a cellphone ? and placed the dreaded phone call home. But it sure beat having a state trooper knocking on the door. "He'd just gotten out of his vehicle and sounded more worried than hurt," said Toby Mincey Sr. "All I knew is we had to get to him." The car, Mincey Sr. said, was "a sight to see. It was an absolute miracle. The seat belts and the airbags definitely saved them. We tried preaching to them that everybody needs to buckle up." A state trooper showed up at the wreck scene and issued a citation for unsafe movement. "Operating a vehicle at greater speed than prudent for the existing conditions," Mincey said, reading from his ticket. Considering what easily could have happened, a bruise on the neck, a traffic ticket and sitting through an hourlong assembly for a lesson that saved a kid's life are a bargain anybody would make.